Clarence Walter Osborn, 101 years old, of Lincoln, a loving husband, father, grandfather, great-grandfather, great-great-grandfather, son, brother, and friend to all, passed away and entered into eternal rest on April 5, 2019. Born to Effie and Walter Osborn on January 23, 1918, in a covered wagon in Martin, South Dakota, bound for Hat Creek, Wyoming, where the family homesteaded until 1927 when they moved back to a farm near Staplehurst. Clarence served in the Civilian Conservation Corps (CCC) near Denton and he worked on dairy farms and the railroad in the 1930s. He enlisted in the United States Army in January, 1941, where he achieved the rank of staff sergeant and served with distinction in the European region during World War II. He was awarded the Silver Star, Bronze Star with Cluster, a Purple Heart, and five battle stars (Normandy, Northern France, Ardennes Rhineland (Battle of the Bulge), and Central Europe. He received Badges for Rifle Marksmanship, Pistol Sharpshooter, Bayonet expert, and Combat Infantry. Clarence married Betty Hunt on January 21, 1949, and they were married for 70 years and raised two children. Clarence retired from Outboard Marine (formerly Cushman Motor Works) in 1982 after 37 years of employment. Clarence and Betty enjoyed walking, bicycling, hiking, camping, and traveling across the United States, and participating in patriotic, athletic, and parade events representing military, senior citizens, and active and healthy lifestyles. Clarence was a member of the Military Order of the Purple Heart in Lincoln and he was awarded a Quilt of Valor from the Veteran's Auxiliary and a Veteran's brick at Lincoln's Veteran's Garden in Antelope Park. 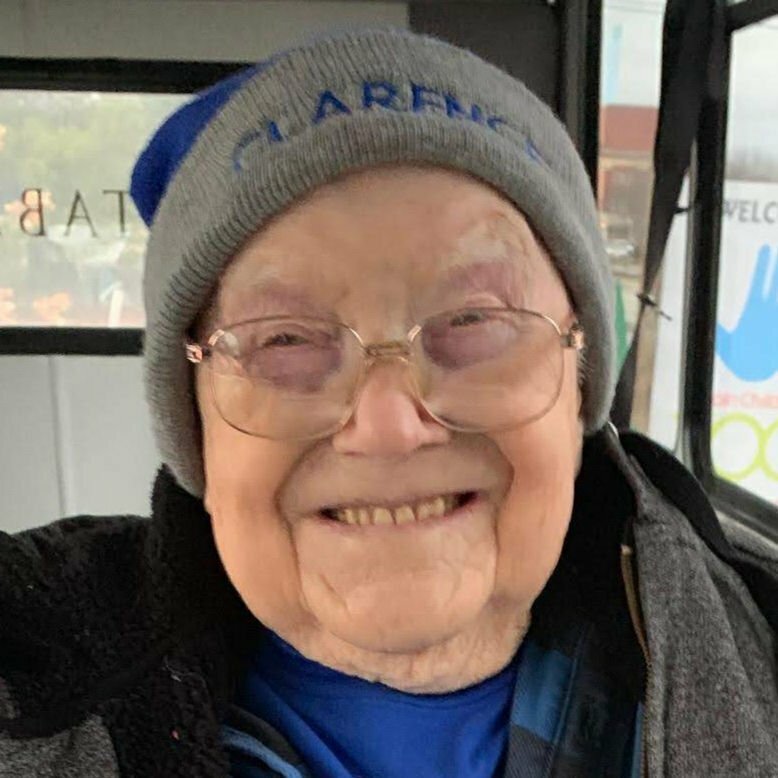 During his retirement, Clarence enjoyed meeting and making new friends and he was recognized for his volunteer contributions in the community, including the Senior Center, Life Lines, Lincoln Public Schools, Lincoln General Hospital, and the previously listed athletic events. He joined the Lincoln Track Club and he ran and competed in numerous running events (e.g. the Cornhusker State Games, Local and National Senior Games, full and half marathons (e.g. Lincoln, Omaha, Richfield, Pikes Peak), 10k (e.g. Buffalo, Bolder Boulder), and other running races. He participated in the Tabitha Miles for Meals Run on March 30, 2019. Clarence was honored with the Nebraska Governor's Healthy Lifestyle Award, received many medals and awards for his running achievements, and carried the torch at the Cornhusker State Games. Some of Clarence's favorite hymns are “What a Friend We Have in Jesus”, “Jesus Loves Me”, and “Amazing Grace” which he learned as a young boy. He often recited the Lord's Prayer and during WWII, he carried a Bible that was given to him by his mother. Clarence is survived by his wife Betty and his two children, Viola Caddell (Ralph) of Milford and John Osborn (Cindy) of Longmont, Colorado. He is also survived by his five grandchildren: (Cathy Radke (Greg) of Seward; Ralph Caddell of Lincoln; Duane Caddell of Fairbury; Tracy Deba (Jamie) of Longmont, Colorado; and Brian Osborn (Sarah) of Aurora, Colorado, and 11 great-grandchildren: Micaella Johnson (Earik) of Fremont; Stephanie Sell (Brice) of Hastings; Vicki Radke of Seward; Andrew, Alexia, Brielle, and Ashlynn Deba of Longmont, Colorado; and Evan, Natalie, Colin, and Blake Osborn of Aurora, Colorado, and one great-great-grandchild, Emma Johnson. Clarence was preceded in death by his infant daughter, Vicki, parents, six sisters, three brothers, and his son-in-law, Ralph. Clarence will be buried at 11 a.m. on Tuesday, April 9, in the Seward Cemetery. Family and friends may gather at the cemetery prior to the services. In lieu of flowers, family requests memorials in his name be sent to the Military Order of the Purple Heart in Lincoln, the Lincoln Track Club, or Tabitha Health Care Services. Trump Funeral Services, 1600 West "O" Street, Lincoln, are handling the arrangements. Condolences may be left at trumpmemorials.com.